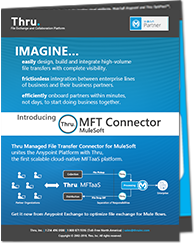 Thru’s MFT Connector for MuleSoft and the Thru OptiPaaS™ platform revolutionize enterprise file exchange by providing the first cloud-native MFTaaS solution that delivers frictionless “plug and play” functionality to the MFT ecosystem for MuleSoft. Designing Mule flows with inflexible, obsolete and messy MFT integration in the 21st century is just wrong! Read the Thru MFT Connector for MuleSoft datasheet.